Anyone who follows this blog knows that I am a big race nut. I love to watch motor racing of all types and go to F1 and MotoGP races all the time. 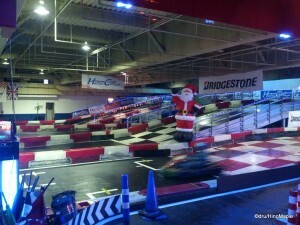 I also enjoy go karting with friends but it can be difficult to find a good friend to go karting with. The last time I went karting was in 2012 during the Japan round of the MotoGP up in Motegi. It was a simple affair where I was racing the Saviour and I easily lapped her in 5 laps. It was fun but not as enjoyable as racing friends who are around the same level as you. 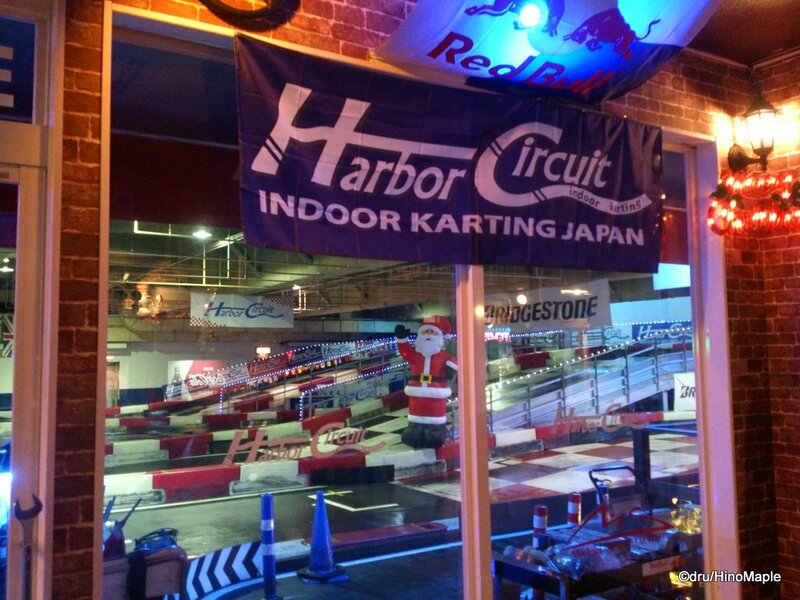 With a couple co-workers, we decided to make a day of karting and headed out to Harbor (sic) Circuit to race. One of my friends was worried he would be lapped and the other is a past racer and still enjoys it. It ended up that we were within 4 seconds of each other and had a great time there. It is something that I will definitely do again, but I can only wish there was a track closer to home. 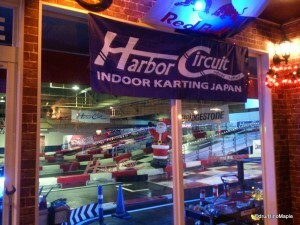 Harbor Circuit is not a track that is convenient for most people. 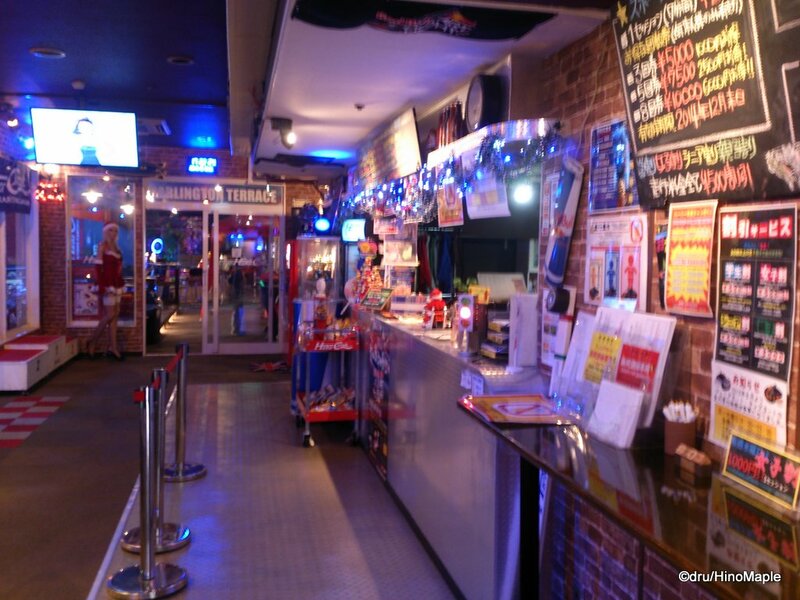 Located near Hon Chiba station, it can be a trip to get out there. First you have to take the Sobu Line out to Chiba and change to the either the Sotobo or Uchibo Lines. They both stop at Hon Chiba station so there isn’t any problems taking either train. Once you are at Hon Chiba, you have to walk about 10 minutes to get to the kart track. Harbor Circuit is not your typical go-kart track. It is an indoor track located inside what looks like a regular building, and it is on the second floor! When I got to the building, I was surprised that the kart track was on the second floor, but it is Japan so anything can happen. The first thing I noticed was the older building and 2 elevators. One of the elevators had a door that was opened a crack and a sign saying it was out of order. We decided quickly that the running elevator was not safe and since the track was on the second floor, a quick walk up was no problem. We entered and had a little trouble trying to figure out what to do. It was a simple measure of turning right, getting the forms, and paying. On weekdays, they have a special for three 7 minute heats for 4000 yen. 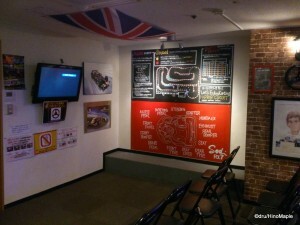 Add the “license” fee of 500 and it was a 4500 yen day of karting for us. The 500 yen license can be seen as a way to enter us into the database and we don’t have to worry about future registration fees. We can just show our license and get racing really quick. After you register and get your tickets for the races, you watch a quick video telling you what you can and cannot do. 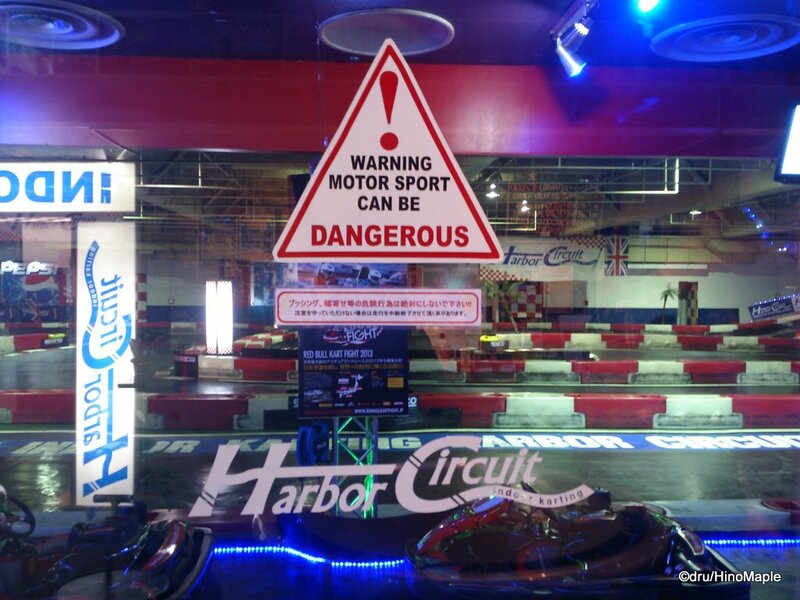 If you have ever gone go karting, you know the rules. The only things you really have to know is that if you get stuck, just wait. The course worker will come and get you. They also have yellow lights that warn you that the course worker is on track and someone is in trouble. The last thing to know is the red lights. They simply mean the heat is over and you have to return to the pits. Whenever there is a yellow or red light situation, they turn on an electronic governor that limits your speed so you can’t go too crazy. You are supposed to just return or drive safely, but that doesn’t always happen when you are having fun and a very fierce battle with a friend. After you finish the video, you are basically allowed to grab a helmet, balaclava, and neck guard before you wait for your heat. You will get a receipt telling you your heat number and your kart number. As you get your number, note that the first person to get their ticket is the first to start and so on. This can be important if you want to set up the race positions. 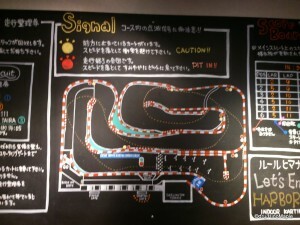 The track itself is very tricky. 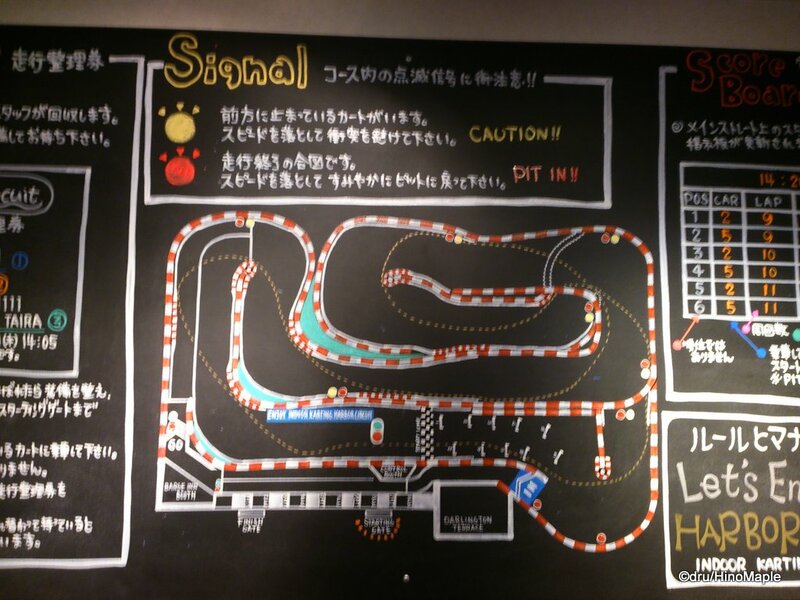 It is not like any other track that I had driven. I usually go to outdoor tracks with asphalt and the one indoor track I went to was in a big warehouse so I didn’t have to worry too much about space. This was a very tight track but open enough that you can get up to a good speed. The track itself is made of rubber in order to cut down on noise pollution but you can easily hear the wheels squealing if you are really pushing it. The first set of corners are challenging as you enter a hairpin and I often drifted through the corner. With one of my co-workers, we would go drifting together like 2 cars in Tokyo Drift and it was the most fun I had in a long time. You then enter the bridge section. You head up a ramp and make take a double apex left and back down the ramp. I learned quickly that it could be taken at full speed with a little drifting and maybe a little hit on the outside wall. I would always get a little air but not a lot. Once you hit the bottom of the ramp you have another hairpin which was difficult to get right. You then head under the ramp which was the tightest area of the track and then a couple corners to the start/finish line. Passing was not easy at all and there were a few good places to pass. With the fastest racer, we would fight a little for a couple laps before he would get in front of me and take off. It was frustrating as he was a good second faster than me most of the time. We had some good racing but he always beat me. My other friend was a couple seconds slower than me on average but he did improve a lot over the 3 heats. He managed to always get in my way and one time he blocked me into the wall and I got a good distance in the air. It was a scary split second as I realized I was in the air followed by the realization that I was about to hit the ground. Getting a good kart is important when racing at Harbor Circuit. My first cart was #4. It was a good kart and it handled well, but it also injured me. I got in front of my slower friend and he T-boned me under the tunnel. I ended up slamming the back of my rib cage into the seat and causing what felt like a bruised rip. It may have been broken but either way there is nothing I could really do about it. I wouldn’t want to race in that kart again if I could help it but sometimes there is no choice. For heat 2, I had car #3 and that was the best car I had. I was able to brake smoothly and power out of the corners well enough. It did lack a little power, in my opinion, but the brakes were so smooth that I was easily slamming them and not having problems. Needless to say I did my best time, a 26.170s with that kart. For my last heat I was in kart #6 and that was a handful. For some reason the kart’s rear kept sliding around and I couldn’t get it to go through the corners as smoothly as I had hoped. I didn’t do too badly, but in that last heat, I caught my slower friend and we decided to see how high I could jump the kart. It was a lot of fun and when I checked my stats, I ended up in 22nd for the day. The fastest racer of the day was 24.231s and our fastest racer was at a 25.733s which was good for 19th. With your license, you can even find out where you place in all time by using your license number and first name. As of writing this post, I was 7296th fastest of all time and 255th fastest for December. If you live in Tokyo or Chiba and you love to go racing, grabbing a bunch of friends and heading out to Chiba to do a little karting is a lot of fun. When I saw the track I thought it would be a simple track and hard to pass. It was hard to pass but it was also a lot slipperier than I had expected. It was also a lot more fun that I had expected. It is important to go with friends who will race with you and know what they are doing. Even if they are doing bad things to ruin a race, it also adds to the challenge and fun. I’m definitely going to go back with the same friends and we’ll definitely try to bring more friends next time too. 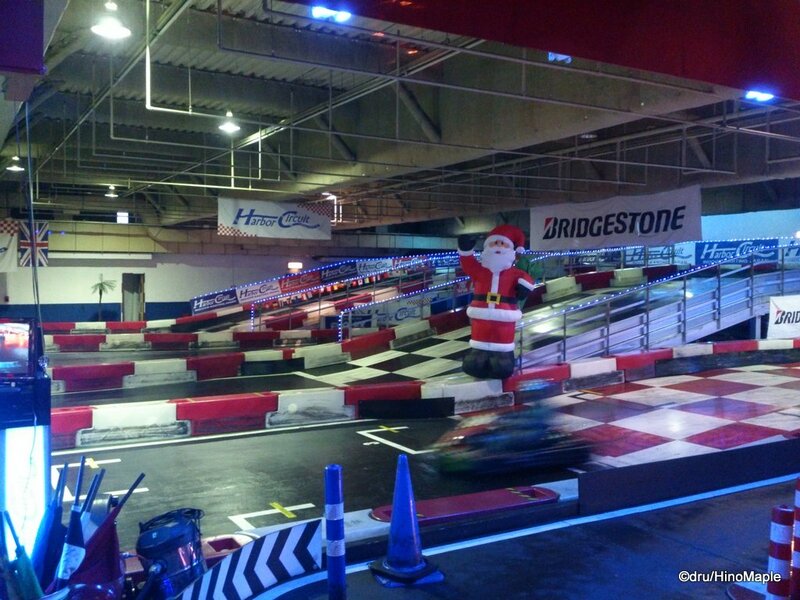 This entry was posted in Kanto, Sports and tagged Chiba, Go Kart, Gokart, Harbor Circuit, Harbour Circuit, Hon Chiba, Hon Chiba Station, Honchiba, Honchiba Station, Indoor Go Kart, Indoor Gokart, Indoor Kart, japan, Kart, Karting by Dru. Bookmark the permalink.